June 9, 2010 - The National Transportation Safety Board on Tuesday dispatched a team to investigate why a Boeing Stearman ST75 (N27WE) ground looped and then flipped on landing on the main runway, 1 at Reagan National Airport at 10:05 AM. The runway was closed for a little more than an hour to allow a crane to come in and turn the aircraft upright onto its landing gear and bought to a hanger. The 1943 World War II biplane was one of eight vintage aircraft that was given clearance to land. The pilot, stated to authorities that while the plane was rolling down the runway after touchdown the pilot tapped the breaks at which time the aircraft cartwheel, landing upside sown. Without injury the pilot and passenger on board were able to climb outside the aircraft. 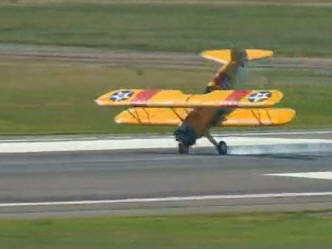 It is still unclear as to what caused the Boeing Stearman PT-17, called the “Yellow Mistress” to have flipped over. 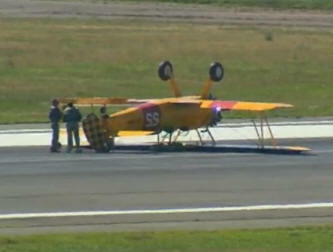 It is likely that the brakes locked up causing the plane to cartwheel. The Yellow Mistress was one of eight vintage planes that flew into Reagan to promote the opening of the 3-D film "Legends of Flight" an IMAX movie at the Smithsonian's National Air and Space Museum in Washington DC. The passenger, Michael Truschel of Nokesville, Virgina is a Washington Post reporter who went along to write a story, caught the incident on video. All eight aircraft with open cockpits were built between 1938 and 1943 had journalist ridding alongside the pilots to cover and publicize the event. The Stearman (Boeing) is a biplane, of which at least 9,783 were built in the United States during the 1930s and 1940s as a military trainer aircraft. Stearman Aircraft became a subsidiary of Boeing in 1934. Widely known as the Stearman, Boeing Stearman or Kaydet, it served as a primary trainer for the USAAF, as a basic trainer for the USN (as the NS & N2S), and with the RCAF as the Kaydet throughout World War II. After the conflict was over, thousands of surplus aircraft were sold on the civil market. In the immediate post-war years they became popular as crop dusters and as sports planes.